Work: Elected to Provincial Congress, 1775, 76; Member of state Council, Committee of Safety, 1776; Elected to Continental Congress, 1776-79; Commissioned Brigadier General of the New Hampshire Militia, 1777- ca. 1781; Appointed Associate Judge to the Superior Court, 1782. William Whipple was born at Kittery Maine, in 1730. He was educated at a common school until his early teens, when he went off to sea to find his fortune. He was an able seaman, earning the position of Ship's Master by the age of 21. He worked hard and amassed a great deal of money. In 1759 he landed in Portsmouth and, in partnership with his brother, established himself as a merchant. Calls to public duty began almost immediately. He was elected to several local offices and was involved in the Patriot movement. In 1775 he was elected to represent his town at the provincial congress. The following year New Hampshire dissolved the Royal government and reorganized with a House of Representatives and an Executive Council. 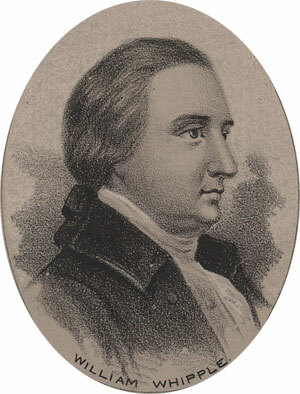 Whipple was made a Council member, a member of the Committee of Safety, and was promptly elected to the Continental Congress. He served there through 1779, though he took much leave for military affairs. In 1777 he was made Brigadier General of the New Hampshire Militia. General Whipple led men in the successful expedition against General Burgoyne at the battles of Stillwater and Saratoga. After the war Whipple was appointed an associate justice of the Superior Court of New Hampshire. He suffered from a heart ailment for several years and he died, fainting from atop his horse while traveling his court circuit, in November of 1785.